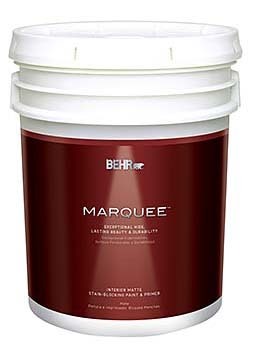 Marquee Interior Paint & Primer is a one-coat 100 percent acrylic collection offering 372 colors. Palette was chosen to achieve deeper, bolder colors. Offers stain resistance and easy-clean finish. Provides up to 400 square feet of coverage per gallon. Available in matte, eggshell enamel and semi-gloss enamel. Low VOC and Greenguard Gold Certified.